This system indicates the current condition of our entire sewer network with regard to overflows into the Red and Assiniboine Rivers. 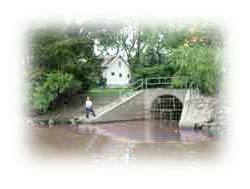 It is based on a reading of high water sensors in the sewer pipes at various overflow locations along the city's rivers, like the one pictured above, together with an assessment of other indicators, such as river levels. What do the coloured dots represent? A white dot indicates that there is a low probability of overflows. A grey dot indicates an increased likelihood of overflows. A black dot indicates a high probability of sewer overflows. Summary of sewer overflows in the last 24-hour period.